Exklusiv für die Diana+ designed ist dieser 35mm Aufsatz. 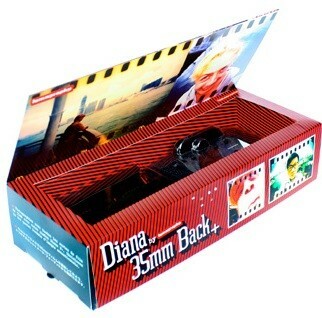 Mit diesem kannst du jede Art von 35mm Film für deine Diana+ und Diana F+ verwenden. 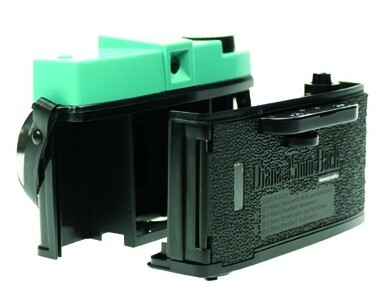 Expressly designed for the Diana+, this 35mm Back allows you to shoot all types (color, slide, b&w) of 35mm film with your Diana+ and Diana F+ cameras. Choose from four different image formats: (1) Square with exposed sprocket holes, (2) Panoramic with exposed sprocket holes, (3) Standard Panoramic, or (4) Standard Landscape. Or go completely wild-style and shoot your own formats - you can choose to advance and multi-expose as much or as little as you like! Two integrated exposure counters tell you the precise frame you're on. It's fully interchangeable and can be easily installed and removed. Package includes the Diana+ 35mm Back, four plastic frames (one for each format) and full documentation.